Home - Klyn Nurseries Inc. 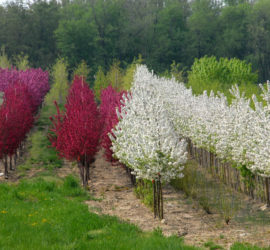 Located in Perry, OH, in the heart of Ohio's Nursery Industry, Klyn has thousand of trees, shrubs, perennials and more. From the tried and true to unique and hard to find varieties. From Conifers to Perennials, and everything in between. 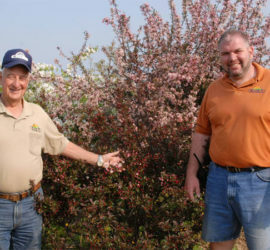 Klyn Nurseries carries over 1600 varieties, with 80-90% of those propagated on site. Our Illustrated catalog shows many of the plants and trees available here. We add new varieties regularly, along with introductions of our own. Whether you need balled & burlapped or container trees & shrubs, we have many to choose from. Today Klyn Nurseries produces over 500 acres of crops in the field and 40 acres of containers. The inventory has increased to over 1600 varieties of plants of which 80-90% is propagated internally. 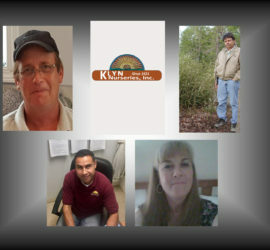 Klyn Nurseries Inc. is a wholesale nursery serving landscape contractors, re-wholesalers, retail garden centers and municipalities. Our primary markets for distribution of plant materials are Ohio, Pennsylvania, Michigan, Indiana, Illinois, Western New York, West Virginia, and Kentucky. 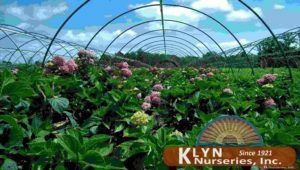 Klyn Nurseries lists over 1600 different species and cultivars to meet the needs of landscapers, garden centers, re-wholesalers, designers, municipalities, and parks. Our inventory includes bamboo, bog & marginals, grasses, perennials, ferns, vines, roses (shrub and climbing), dwarf conifers, shade and ornamental trees. Much of what we grow is native to the area we supply. - over 230 varieties, including Acer, Aesculus, Cornus,Magnolia, and Quercus. - 97 genus, incuding Hydrangea, shrub roses, Spiraea, Viburnum. - boxwood, pines, spruce, taxus and more. - spirals, pom poms, top grafts, espaliers. 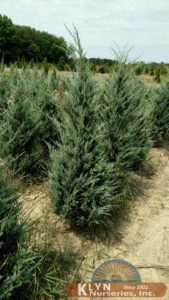 - 25 varieties of dwarf pines, spruce and more. - 63 varieties of Chamaecyparis. - 418 varieties, including hosta (28), daylilies (41). ORNAMENTAL GRASSES - 89 varieties including Carex, Miscanthus, and Pennisetum. - 35 varieties, including Fargesia, Phyllostachys, Pleioblastus, and Sasa. - 25 varieties of native and oriental, including Athyrium, Dryopteris & Osmunda. - 32 varieties, both decidious and evergreen. - 86 varieties, including Acorus, Iris, Juncus, Petasities and Typha. - 69 varieties, including honeysuckle, akebia, kiwi, hops & Vitis.